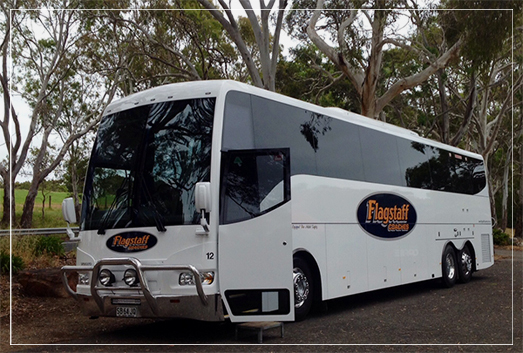 Flagstaff Coaches offers a complete range of coach transport solutions from group charter and transfers to long distance and interstate touring services. Our fleet of luxury touring coaches are clean and reliable and driven by our experienced coach captains who know and understand you the customer. The company is South Australian owned and operated, and has extensive experience in the passenger transport industry. Flagstaff Tours, operates an extensive program of tours ranging from One Day to Twenty Days. There are tours that suit all budgets and to many different areas of Australia. Click on the Tours button in the navigation area to the left to view our extensive touring program. If your group requires a coach for local Adelaide charter or Interstate charter then fill out our Booking Enquiries form and we will respond immediately with a quote for your particular requirements. If you are unsure of planning your trip, then Flagstaff Coaches can assist with itineraries and accommodation bookings. Flagstaff Coaches and Tours is a Licensed Travel Agent TTA 177672. For your protection, it is wise to only do business with coach companies who are licensed to sell accommodation.